Few things engage me as much as text mining. I've had some time to play recently so I created a new toy that allows me to catch up on the news in an interesting way. The essential mechanism is simple: use RSS to get data from a few news feeds, do some simple term analysis, add a sprinkle of "intelligent tagging", and presto! 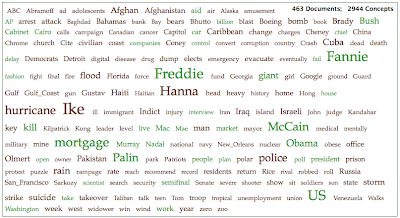 You can click each term in the tag cloud to see a list of news articles where the term appeared. You can click over to the original article if it gets your attention. Tag clouds are not new. The presentation here isn't half as pretty as wordle. But it was fun to create and I hope you enjoy it as well.